On Monday I posted a picture of a tooth from an animal that is a famous California resident, although is not generally considered an Arkansan. Were you able to figure it out? The tooth is a canine from a Smilodon, the saber-toothed tiger (although not actually related to tigers). Smilodon fossils have been found in a few caves in the Ozarks of northern Arkansas, most notably Hurricane River Cave and the Conard Fissure (the Conard Fissure was excavated by Barnum Brown for the American Museum of Natural History, who also did a lot of famous dinosaur digs for them in the Rockies) . 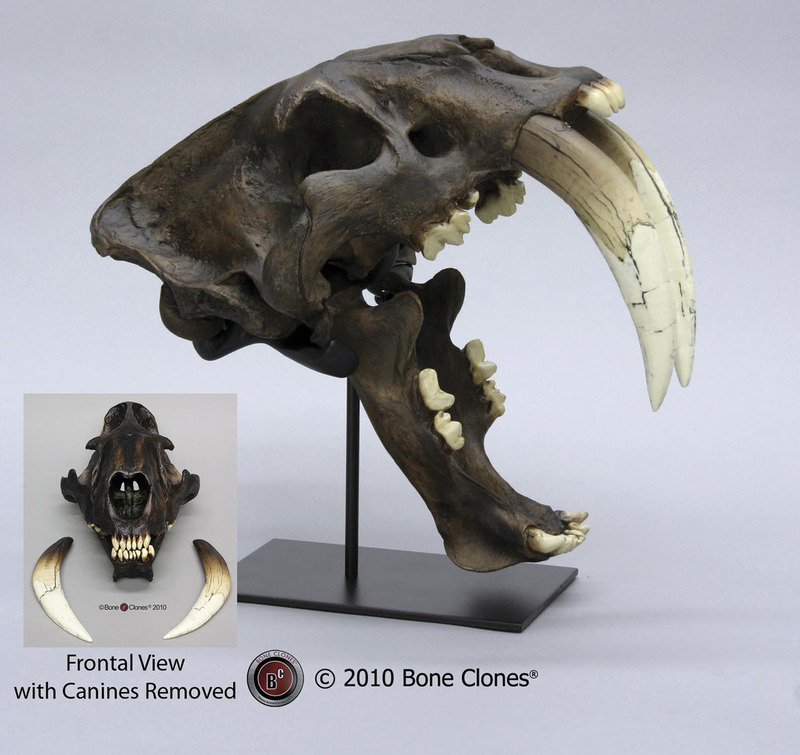 Originally, they were described as having come from two different species of Smilodon: S. fatalis and S. floridensis. Smilodon fatalis, sometimes called S. californicus, is well-known from the La Brea Tar Pits in California, although has been found throughout much of North America and Pacific coastal areas of South America. Smilodon floridensis was known primarily from, unsurprisingly, Florida and neighboring states. However, these days most researchers view them all as the same species, so just Smilodon fatalis. There are two other recognized species. Smilodon populator lived in South America and was bigger, with a few hundred more pounds on S. fatalis. Smilodon gracilis was half the size of S. fatalis and lived earlier than either of the other species, and is considered by some to be ancestral to them. Smilodon fatalis is the quintessential Ice Age predator. It appeared about 2.5 million years ago and only died out about 10-13,000 years ago, so it may have been possible that Smilodon preyed upon early humans, at least along the Pacific coastal areas. It was a big, burly cat weighing up to 600 lbs. with heavily muscled forelimbs. Of course, it is best-known for its 7” long, serrated canines, thus the name Smilodon, meaning “carving knife tooth”. Smilodons were part of a group known as Machairodontinae, a subfamily within Felidae known as the “dirk-toothed cats.” These long teeth necessitated a jaw that could swing extraordinarily wide. Smilodon was specialized for killing large prey, such as bison, horses, and young mammoths and mastodons. 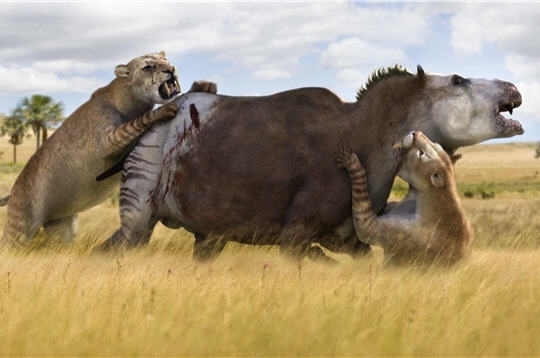 Much debate has centered on how it dispatched its prey, with depictions of a Smilodon burying its canines in the skull or eviscerating its prey. However, more recent studies have indicated the canines were too fragile to withstand such treatment or couldn’t get a sufficient bite to properly tear into the abdomen. It is thought instead that Smilodon used its powerful forelimbs to stun and restrain the prey until it could bring its canines into play with its powerful neck muscles to slash the throat and cut the major arteries, causing the animal to bleed out quickly. They were not fast runners, preferring to attack from ambush, staying hidden within the vegetation of the forests and bushlands it preferred to live in. B. Brown, The Conard Fissure, A Pleistocene Bone Deposit in Northern Arkansas…,Memoirs of the American Museum of Natural History, Vol IX, Part IV, February 1908. By paleoaerie in Fossils of Arkansas, Mystery Monday on January 31, 2014 .